Whiskey came to us after her previous owners had a new born baby and Whiskey didn’t cope well with the new arrival. 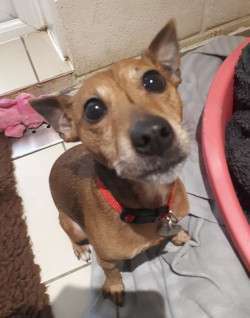 Whiskey is a sweet little girl who needs a little more socialisation with dogs and people as she does like to bark at visitors or strangers in the home. On walks she will trot alongside you on the lead but can be nervous of other dogs approaching, however this is her way of communicating and once you have greeted her she will shower you with kisses and affection and gains her confidence quickly. We do feel Whiskey would prefer to live in a quieter home as the only pet, but would be fine with visiting older children. Whiskey loves the company of people and would suit someone who is home a lot of the day and has time to give her plenty of cuddles and walks and a little training. Have you got space for this sweetie to sit beside you on the sofa?